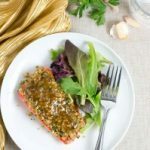 So deliciously tasty, this quick and easy Maple Walnut Crusted Salmon is bound to become a favorite. One of those recipes that you'll want to know by heart! Preheat oven to 400 F. Season salmon with salt and freshly ground black pepper. Add the walnut crust ingredients in a food processor and process until mixture is finely chopped. Dredge each salmon filet with walnut mixture. Add the glaze ingredients to a small sauce pan and heat over medium heat. Bring to a boil; reduce heat to low and simmer until slightly thickened. Pour one half of the glaze over the walnut crusted salmon filets and reserve the other half to serve immediately before serving. Bake salmon at 400 F for 15 minutes.